For us, the beauty found in giving gifts is simple; it’s the thought and sentiment behind every single gift, as unique and individual as each and every one of us, that turns giving into art. Think of that feeling you get when you watch your loved ones open a gift from you, something you know they’ll cherish. Or that moment when you find that perfect present for someone special, and you can’t wait to see their face as they open it. We at Native Sister understand that feeling and strive to embody it in truly unique and beautiful gift boxes. We’re here to help you honour those memorable moments and mile stones, say hello to old friends and show the important people in your life how much they mean to you; letting them know that they’re thought of and loved. If art is beauty, what’s more beautiful than that? No one in the world is like you and you are limited only by your imagination – so let’s take a risk, add your personal flair and don’t be afraid to think outside the box (or rather, in the box!) We can’t wait to help you embrace your inner artist and enjoy the wonderful feeling of giving. Art (noun); the expression or application of human creative skill and imagination, typically in a visual form such as painting or sculpture, producing works to be appreciated primarily for their beauty or emotional power. We're Aimi and Emma, spiritual sisters and natives of Scotland. Maybe growing up surrounded by the breath-taking beauty of our homeland is what nurtured our creative souls and sent us on a journey to Gray’s School of Art. 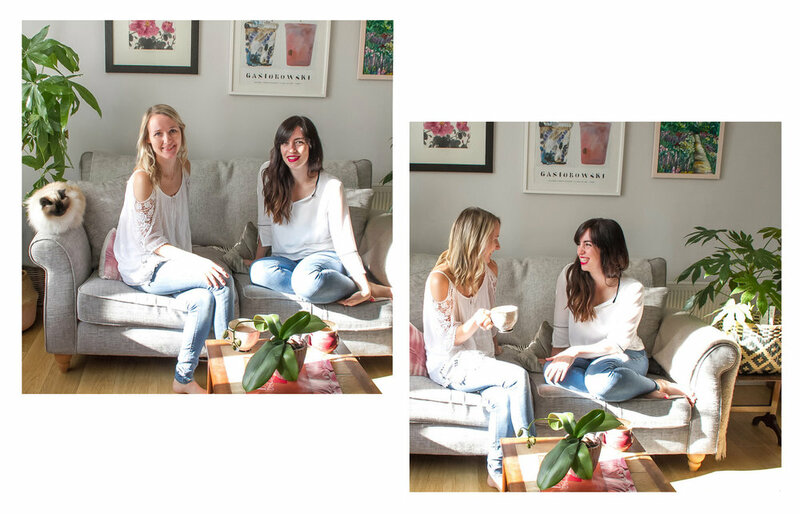 This is where we first met and bonded over all things design. Four years passed in an all too quick blur and, with degrees firmly under our belts, we went our separate ways for careers and love. We had the task of keeping our friendship alive without seeing each other regularly, and anyone who’s ever had a long distance relationship knows how challenging this can be! Still, we always made the time to connect, picking each other up whenever it was needed, celebrating and commiserating everything life threw at us. Maintaining relationships long distance, not only with each other but with family, friends and partners, is where the seed for our gifting dream was planted. We found it challenging to find unique and special gifts for our loved ones without trawling the shops or internet for hours. And even when we did, adding a personal touch and posting it ourselves cost an arm and a leg! We knew there had to be a better way to make the whole process of gifting inspiring, enjoyable and affordable in both time and cost. Six cities, five countries and one seedling of an idea later, we found ourselves back in Scotland and launching our first joint vision – Native Sister. Our purpose is simple; we make buying bespoke, thoughtfully curated and beautiful gifts effortless for you, whilst making it feel as personal as though you’d spent hours putting it together yourself. We’re passionate about helping you nurture your relationships with those nearest and dearest to you, whether they’re round the corner or miles away. We promise that when it comes to letting the most special people in your life know you’re thinking of them, we’ve got your back. Thanks for taking the time to get to know us just a little…we’re looking forward to getting to know you too.